Legend said that Burnett’s Mound would always protect the city of Topeka, Kansas from a tornado. The large mound, located southwest of the city was said to have been blessed by an Indian chief. It turns out that the legend was likely more of a ploy by City leaders to minimize the negative perception that frequent tornadoes were a problem for new businesses and residents. The legend was certainly debunked on June 8, 1966 when an F5 tornado destroyed a large part of the city. Entire neighborhoods were destroyed, 820 homes leveled and sixteen people died. It was the first tornado in United States history to produce $100 million in damage. Author and Topeka native Bonar Menninger has written a tremendous account about the event, which shaped his young life. SUBJECT MATTER: Grade A. The Topeka tornado is an important event in Kansas and American weather history. Menninger presents a clear theme of the immense power of nature and man’s attempt to prepare for and adapt in the face of it. The science of tornadoes is clearly presented and the accounts of the storm told against an interesting backdrop of the current events and culture of the day and place. EXPLANATION OF TOPIC: Grade A. From all angles, Mr. Menninger did his homework. The amount of research that he did is clearly evident and this allowed him to treat to subject thoroughly. A big plus is his clear warning that overpasses are not places of refuge in a tornado. QUALITY OF WRITING: Grade A. This is not Mr. Menninger’s first rodeo. He penned a controversial book about the JFK assassination several years ago and has written extensively for business journals. CHARACTERS: Grade A. Extensive interviews allowed the author to make the characters very real in my mind. The reader can identify clearly with them. One of the most important characters in the book is the Meteorologist in Charge of the Topeka Weather Bureau Office, Richard Garrett. TECHNICAL LEVEL: Grade A. Menninger gives a thorough explanation of the warning process circa 1966 and how it evolved as well as how supercell thunderstorms and tornadoes work. It is clearly written for a layperson, but still interesting for the knowledgeable person. METEOROLOGICAL ACCURACY/DETAIL: Grade A. Mr. Menninger gets his weather right. I could find no evident errors in his discussion of meteorological topics. He does an especially good job with things like the balloon launch and the work of John Park Finley, the first tornado researcher. ACTION/SUSPENSE: Grade A. The various subplots draw the reader in and carry him or her along like the advancing storm. The book is a real page turner, with a fast pace. ILLUSTRATIONS: Grade A+. The book features captivating, well done hand drawn maps. The black and white photos, many by newspaper journalist Perry Riddle, underscore the fury and power of the tornado. Things I learned included the story of how the tornado jump started the career of famed newscaster Bill Kurtiss. Menninger also tells the story of the debunking of the dangerous myth that we all grew up with that said the safest place in a home or building was the southwest corner. A University of Kansas professor challenged this safety rule and eventually led to its removal. I thought it also fascinating that the three beeps used by radio station WREN every two minutes during a severe weather watch would be investigated by a jumpy U.S. Government after some idiot complained that they could be being used as a signal to foreign agents. It pointed out fearfulness of that Cold War era. The main takeaway for me from the book was that preparedness is key. The tireless work of Mr. Garrett saved countless lives that day, despite the destructive power of the tornado. By reading this book, you will gain a thorough understanding of the history of tornado forecasting, as well as how the violent storms work. It also teaches some excellent safety points. 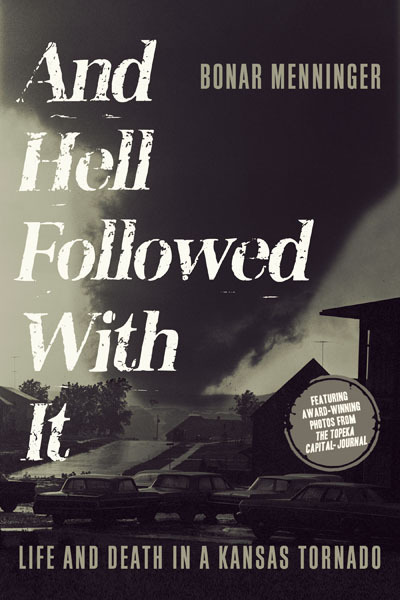 Overall, it is one of the best weather disaster books I have ever read. For more information on the book, go to https://www.topekatornado.com/index.htm. You can buy the book on the Amazon and Barnes and Noble websites, or directly from the author’s website.